Reading has emerged the bookmakers' favourite to become the town which will gain city status as part of the Queen's Diamond Jubilee celebrations next year. The Berkshire town, which is set to submit its bid next week, is up against other hopefuls including Middlesbrough, Blackpool and Tower Hamlets in London. Ladbrokes has given it odds of 6-1, Paddy Power 8-1 and William Hill 9-1. Reading East MP Rob Wilson, Conservative, said the most important thing was having a "superb bid". Conservative colleague Alok Sharma, who is Reading West MP, described the town as an "economic powerhouse". The official bid will be handed in next week with the successful candidate announced early next year. Mr Wilson said "I'm always dubious about being a front-runner or a favourite because it tends not to always work out the way you want it. "The most important think is that we have a superb bid to make on behalf of Reading." 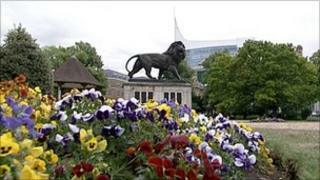 Reading West MP Alok Sharma said he was "delighted" the town had been was considered one of the front-runners. "Reading is key commercial centre in the region and already has many of the attributes of a city, he added. A board including representatives from the council, businesses, the University of Reading and churches has been set up to draw up the bid. The borough council said there would not be any taxpayers' money spent on the bid and it will use volunteers where possible.